We are doing a variant calling from an alignment done by BWA-MEM, in our proof of concept we expect to find a variant. The variant is after an homopolymeric region (13A). When we look at the alignment with the IGV, the variant is clearly present as you can observe in the image attached, but when we do the variant calling by GATK with the command below, the variant is not reported. How can we modify the filtering to solve this problem? Any hint? 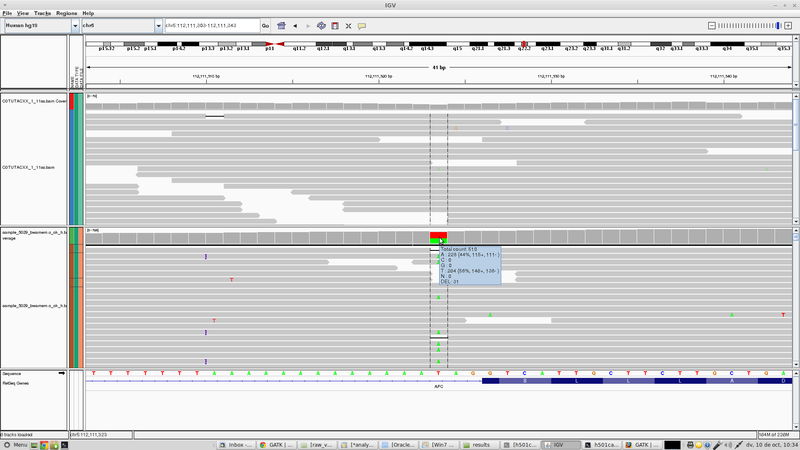 We recommend using HaplotypeCaller for these cases, because HaplotpyeCaller is much better at detecting indels. Thank you Sheila, I will try HaplotypeCaller, our variant is a substitution, but may be works anyway. Thank you again.